Drafting Concepts is a residential building design company in Queensland Australia with offices in the Brisbane and Sunshine Coast area. Our home design process leverages high technology software and drafting tools to allow us to create accurate designs for new homes, renovations, alterations, and home extensions. We can provide both builders and home buyers with a free drafting quote to start off their project. 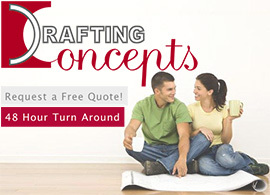 We also offer a free one hour consultation to help you clarify your ideas and to get the process started.